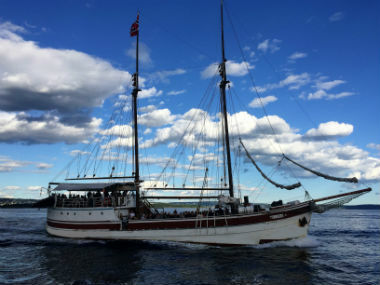 Classical schooner, excellent for all types of celebrations and events. S/S Helena was built at Moen Båtbyggeri in Risør in 1946. She is a large, solid vessel, built in wood, constructed according to all the principles associated with the art of shipbuilding. Her liberal dimensions and wide deck provide generous space both below and above deck. 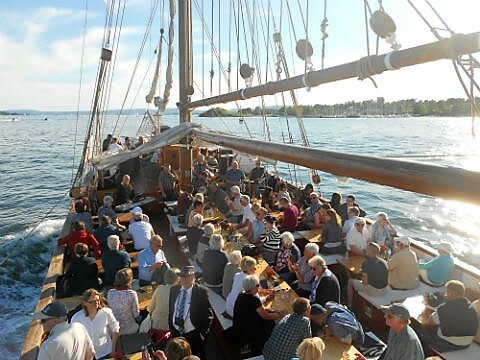 She has a spacious bar area in the stern saloon’, and the main saloon sits up to 85 guests. What makes the Helena so unique is that there is seating for more than a 120 guests on deck. On warm (or wet) days large awnings are put up over both decks. This vessel offers all comfort necessary to ensure a enjoyable trip for up to 150 guests.